A team of researchers at the University of New South Wales has delivered dire news for polar ecosystems, predicting that in some regions biodiversity may be reduced by as much as a third within decades. This is a result of global warming: as the poles warm up, sea ice will melt earlier, allowing a lot more sunlight to reach the sea bed. The team's study predicts that this can have a significant effect on the creatures that live there. Invertebrates that are adapted to live in dark conditions will be pushed out and replaced by algae that thrive on light. And while those invertebrates — sponges, moss animals and worms — are not as iconic as polar bears and penguins, they play an important role not only as part of the food chain but also because they filter water and recycle nutrients. 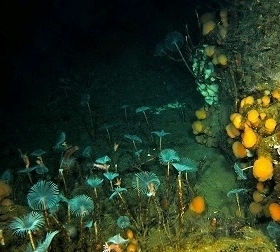 Fan worms (turquoise) and sponges (orange) under the sea ice in Antarctica near Casey Station. Image: Graeme Clark. The drastic change predicted by the researchers is an example of what is called a tipping point: a small change in one feature of a system can make a drastic, and sometimes irreversible, difference to other features. As an example, think of a tea mug placed on a table. If you bump the table a little bit, the mug will wobble but eventually settle down again. That's because it's in a stable position. If, however, the strength of your bump exceeds a certain threshold value, the mug will tip over and eventually settle in another stable position, lying on its side. Once it has done that only a very large bump has the chance to put it upright again. To determine the threshold value you could perform lots of messy experiments, but you are better off predicting it from the mathematics that describes the forces at play. In climate science tipping points are a major worry. A small change in environmental conditions could cause major and potentially irreversible ecological shifts, such as turning lush landscapes into deserts. "Identifying future tipping points is a major goal in the management and conservation of global biodiversity, and is increasingly urgent as climate change modifies the environment," the Australian team say in their paper. Scientists try to predict tipping points by identifying mathematical relationships between the many factors that drive an ecosystem. The team suspected that biodiversity in polar regions may depend, in a similarly sensitive way, on when in the year the sea ice melts. The poles are particularly vulnerable because of the Earth's tilt. Around the summer solstice a lot more sunlight hits the pole on a single day than during winter, so an ice-free sea around those days can have a major impact. "Early melt that brings the date of sea ice loss closer to midsummer will cause an exponential increase in the amount of sunlight reaching some areas per year," says Graeme Clark who is part of the team. 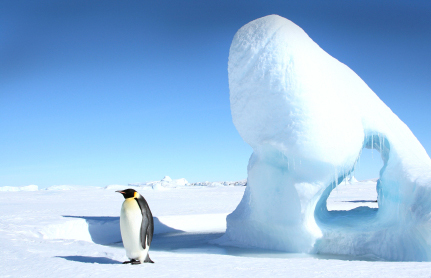 Polar sea ice cover is essential for biodiversity. To work out the impact of this the researchers observed the amount of light and sea ice cover in several regions in Antarctica and they performed field and lab experiment to work out how much light certain species of algae require and how sensitive they are to it. They also observed sub-tidal boulders to see how communities of species living there depend on sea ice cover. Using all this information they constructed a mathematical model which describes how biodiversity depends on sea ice cover and predicts how it might change in response to different rates of sea ice reduction. "Earlier sea ice loss is likely to cause extensive regime shifts in which endemic shallow-water invertebrate communities are replaced by algae, reducing coastal biodiversity and fundamentally changing ecosystem functioning," the researchers conclude in their paper. "Modelling shows that recent changes in ice and snow cover have already transformed annual light budgets in large areas of the Arctic and Antarctic, and both aquatic and terrestrial ecosystems are likely to experience further significant change in light." "This is a prime example of the large scale ecological impacts that humans can impose through global warming – even in places as remote as Antarctica," says team member Emma Johnston. The study Light-driven tipping points in polar ecosystems will be published in the journal Global Change Biology.